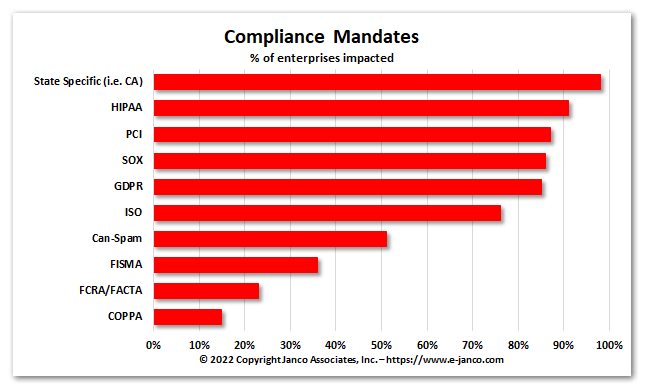 Mandated compliance requirement management - Numerous laws and regulatory mandates focus on corporate governance and accountability around sensitive. The cost of this continues to explode. Continual storage expansion - Analysts estimate that the volume of business e-mail is growing by 25–30 percent each year, and currently, the world's information base will double in size every 11 hours. Compressing data to minimize the amount of storage space that is required. Archiving data to lower cost media to free up high-value storage space and keep databases running smoothly. Increased administrative cost due to system complexity - Janco has found that 75 percent of all companies have three or more enterprise database management system (DBMS) products in their environment. Metrics show that many DBAs devote up to 80 percent of their time to routine systems maintenance. Simplifying management processes and eliminate unnecessary administrative tasks by automating basic database administration functions. Outsource routine activities to give in-house DBAs more time for new projects. Quick fixes that result in Server Sprawl - Small cheap servers may limit IT spending in the short term, but often is not the best nor most cost effective long-term solution. Reliability and scalability requirements increase overhead - Most enterprise information is contained within IT systems, it is absolutely critical that those systems be available whenever your employees or your customers need them. With 24x7 availability requirements, systems have to scale as workloads increase. Reliability improvements and scaling by adding staff and servers can result in the wrong infrastructure and raise costs. Metrics HandiGuide is over 300 pages, defines 540 objective metrics, and contains 83 Metric reports that show over 220 objective metrics. An Adobe PDF document with electronic bookmarks. ITIL and ISO 20000 Compliant.